Bailey Yarbrough, right, at St. Catherines Island. While the beach is commonly seen as a place for vacation, sun bathing, and jet skis, we often tend to forget that we are entering a wildlife habitat. 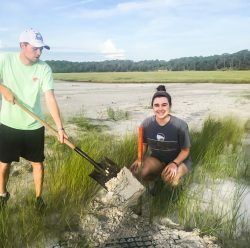 Bailey Yarbrough (biology ’21), however, sees the environmental aspects of beaches first and foremost. Last summer, Yarbrough volunteered with the Georgia Southern University Sea Turtle Program at St. Catherines Island for ten days. While tending to sea turtle nests, Yarbrough also participated in research. She focused on documenting sand temperatures effects on turtles arriving to nest. “My partner and I were looking at the sand temperature and resistance, the dense or soft texture of sand, on the crawlways of turtles. We were interested to find out if there was any consistency in the sand temperature or resistance in turtles who nested or who had a false crawl. A false crawl happens when a turtles comes to land but does not nest,” she said. Unfortunately, Yarbrough did not find any correlation. However, this experiment was limited to St. Catherines Island. On a larger scale, Yarbrough would be able to find more evidence. During this experience Yarbrough saw gopher tortoises, diamond back terrapin hatchlings, and lemurs. “I helped to deliver loggerhead hatchlings who did not successfully crawl out of the nest, so we carried them down to the water and let them crawl in,” she said. Yarbrough stresses the importance of reaching out to local communities and programs to find experiences to add to your undergraduate career. “Be active in looking for opportunities, there are a lot of amazing opportunities available through Georgia Southern and in the surrounding areas! Talk to your advisor too, they may know specific professors or programs you would be interested in! You just have to be proactive,” she said.